July 23, 2013, Truckee, CA: After two initial rounds of stroke play at the 66th U.S. Junior Amateur Championship, a solid layer of cream rose to the top of the leaderboard before the start of match play, with several favorites among the 13 players under par. Leading the pack at 8 under par on the 7,740-yard Martis Camp course in Truckee was the certified Big Dog, Jim Liu of Smithtown, N.Y. The youngest Junior Amateur champion ever with his 2010 victory, Liu was runner up last year, has played in four of these tournaments for boys under 18, and goes into Wednesday with a 14-3 match play record. 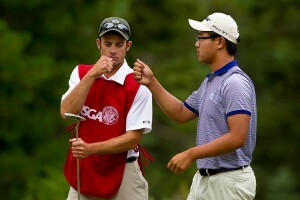 Jim Liu consults with his caddie, Martis Camp looper Eric Hedspeth. Alone in third place at 5 under par was two-time Texas 4-A high school state champion Scottie Scheffler of Highland Park, playing in his fourth consecutive U.S. Junior Amateur. In a tie for fourth at 4 under was Davis Riley, of Hattiesburg, Miss., who made it to match play last year. Others in the red included Sam Horsfield of England – – coming of an 11-shot victory on June 23 at the Florida State Amateur – – and Cameron Young of Scarborough, NY. A field of 156 amateur boys 17 years old or younger started play on this Tom Fazio-designed mountain course, which is more than 400 yards longer than any other used in U.S. Junior Amateur history. Length is not considered much of an issue, since at an elevation of nearly 6000 feet, balls can fly up to 15 percent farther than at sea level. But the altitude also has its downside, since the final two in match play will have potentially played the equivalent of 10 rounds in 8 days, over steep terrain and in lung-burning thin air. “It’s a thrill to see the Martis Camp community embrace this championship and rally to support the USGA and players,” said Gus Jones, head golf professional at Martis Camp. “Hosting a national championship like this takes a tremendous amount of coordination and member participation. We’re anxious to get the event underway . . . and crown .a new Junior Amateur champion.” The 66th Junior Amateur is the area’s first USGA event since the 1980 U.S. Amateur Public Links at Edgewood Golf Club on the south shores of Lake Tahoe. More than 35,000 golfers from more than 80 nations submitted entries to play in the 13 national championships held by the USGA this summer. More than 650 golf courses donated their facilities for local and sectional qualifying. The finals are held at tracks fabled and others largely unknown. For example, the U.S. Open paid its fifth visit to the venerable Merion Golf Club in Ardmore, PA., which proved beyond a doubt that modern golf technology was no match for an old dog’s sharp teeth. (The 113th Open was Merion’s 18th USGA national championship.) The 68th U.S. Women’s Open was held at the relatively new Sebonack Golf Club, which hosted its first USGA title event, hard by the water on Long Island and near Southampton. Arguably, not a single or qualifying location offered as scenic a venue as Martis Camp, where fairways unfold like natural meadows between a forest of Ponderosa Pine and fir. Set on a flank of hills above Martis Valley, with the Sierra Nevada in the distance and tees framed by views of Lookout Mountain’s Northstar-at-Tahoe Resort ski runs, the course is a major piece of private-gated community that’s about so much more than golf. Scattered over 2,177 acres, Martis Camp has more than 650 home sites, nearly 500 of which have been sold since the development’s opening in 2007. During the worst of the Great Recession, work on homes continued while the DMB/Highlands Group, the Martis Camp developers, plowed on with infrastructure work on it’s activity-rich family barn, a 50,000 square-foot clubhouse and its Lookout Lodge, at the foot of the community’s private ski lift to Northstar-at-Tahoe. Today, more than 100 homes are under construction in the year-round playground, with its grand Fazio golf course, the ski runs and a 30-minute drive to the azure beauty of Lake Tahoe. The U.S. Junior Amateur is a prestigious feather in the club’s golf hat, yet not entirely without sacrifice. For a club that’s open only four to five months a year, its members lose an entire week of golf, including two weekends. And yet, many members are putting up junior amateurs and caddies in their homes this week, volunteering for event, and embracing the experience of being ground zero for a national championship. Martis Camp head pro Gus Jones predicted that length would not bother today’s junior players, many of whom have swing speeds comparable to PGA Tour professionals. But during stroke play, some were clearly much longer than others. And as one might expect of teen amateurs, some green-side chips were chunked, while snapped drives bounced on Ponderosa Pines. But there was real excellence. On the strategic and drivable 314-yard, par 4 16th hole, Edmond, Oklahoma’s Nick Heinen – – packing his own bag – – pitched in a 60-yard shot for a eagle, which put him at a tied for 38 in the tournament and into match play. In the next foursome, and also packing his own bag, William Register of Burlington, N.C., drove the green and two-putted for birdie, leaving him tied for 12th at 1 under. Well over half the field failed to make the cut, at 7 over par. And while it is indeed true that anything can happen in match play, it might be interesting to see if the Big Dog and his local caddie continue to hunt.